This DVD review covers a tutorial disc we think you will find to be not only entertaing and informative, but also very worthwhile adding to your collection. 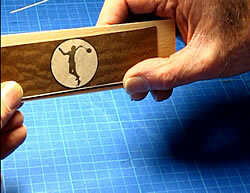 The title of this tutorial DVD is Marquetry Techniques and Tips. 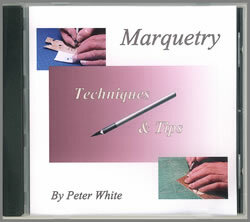 It was put together by master Marquetarian Peter White, so you know from that information alone that this disc is going to teach you marquetry skills you will find invaluable in creating your next marquetry masterpiece. Our tutor Peter, is as many of you will know, a Rosebowl winning Marquetarian of the highest calibre. Not only does Peter produce marquetry pictures of extreme beauty, his applied pieces rank up there in the highest echelons of the craft. Given what we have just said, you can gather that any advice Peter is going to give us is going to be well worthwhile and very helpful in furthering our expertise and personal ability in the marquetry realm. Photo left: Cutting a letter "M"
This DVD takes us through several useful techniques that will help you to cut in lettering and add curved stringers with no splits or breakages at all. 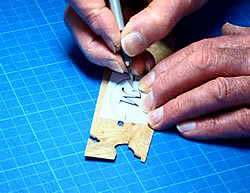 How many of us, for instance, have carefully cut delicate lettering and had it crumble on us when we tried to remove it from our selected veneer? 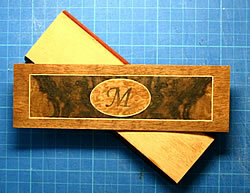 Well, Peter teaches us the secrets of how to make perfectly cut and inserted lettering in a veneer design. We are guided through many, what at first seemed like, complicated tasks by Peter's confident and friendly commentary; and in consequence we are engendered with the confidence ourselves to 'have a go' at many techniques we wouldn't have previously thought possible. 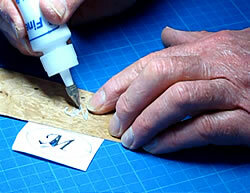 A very singular tip that caught our attention and impressed us immensely was the (in hindsight) obvious advantage of using a PVA glue bottle with a pen point sized application tip in order to place just the right amount of glue precisely where it is required. 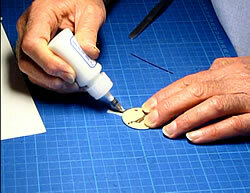 This tip on its own sure beats that problem of large blobs of glue getting over everything! As would be expected from a DVD produced by Peter, the video and sound quality are first class. Peter has put a lot of thought into this tutorial disc. It plays perfectly in computers and standard DVD players. The photography, video and audio are sharp and clear - and the lessons run in a logical sequence that is very easy to understand. We think you'll find this DVD contains tips and advice which will prove useful to marquetarians whatever their levels of experience. There is something to learn for everyone with this disc. Even our editorial team (who thought they knew it all) have learnt a few new wrinkles here! Therefore we think we can say we most definitely recommend this DVD to you. The screen shots seen in this review have been taken directly from the DVD itself.